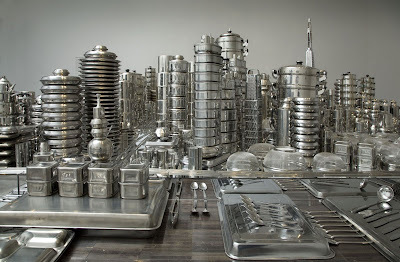 Those of you in the Bay Area oughta hightail it over to the Asian Art Museum and check out Beijing artist Zhan Wang’s exhibition “On Gold Mountain.” It’s a sculptural representasian of the Chinese immigrant experience and includes a San Francisco cityscape constructed entirely out of pots, pans, and silverware. If you look closely, you can see that the Transamerica Pyramid is made out of a CHEESE GRATER. How cool is that? “On Gold Mountain” runs until the 25th of May.